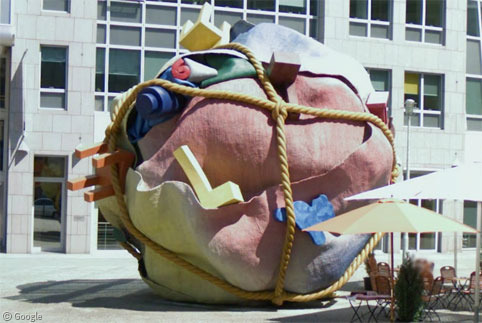 We’ve visited a handful of large-scale sculptures by Claes Oldenburg and Coosje van Bruggen in the past, but because we love them so much we thought we’d do a comprehensive round up of as many as possible, in roughly chronological order1 of their creation. 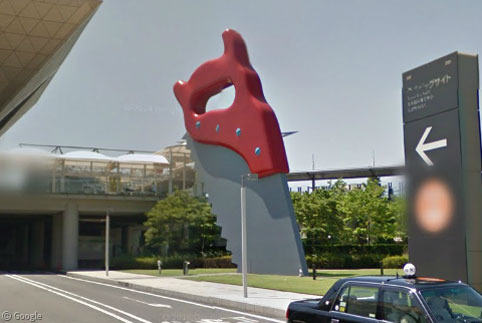 Clothespin is an Oldenburg work in Philadelphia – one of several pieces in the city that this writer saw during a visit last year, the 13.7m (45′) weathered steel sculpture was erected in 1976. 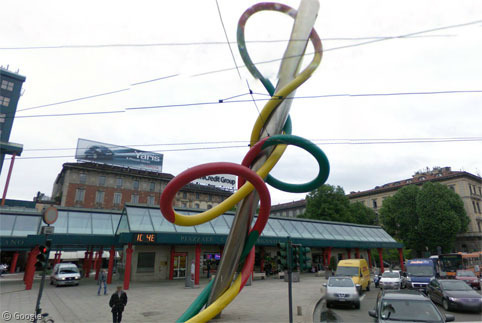 These prolific artists produced one or more public sculptures – usually of everyday objects – almost every year from 1976 onwards, in countries spanning the globe, meaning that this will be one of the largest posts we’ve ever done on Google Sightseeing. 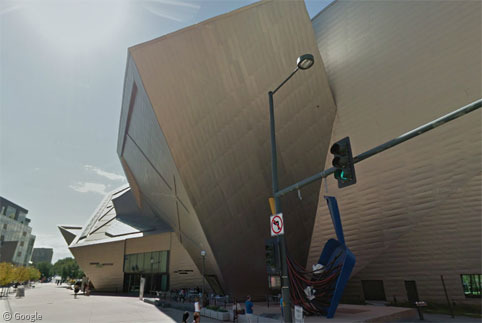 We’ll keep the text to a minimum and let the Street Views, satellite images and PhotoSpheres do the talking. 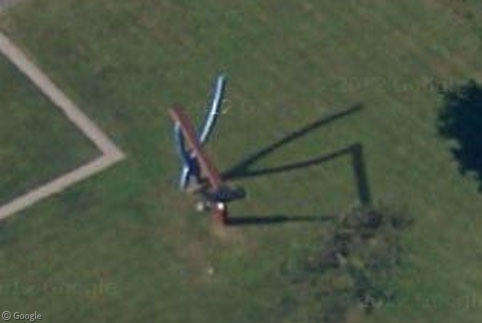 There are a few faintly visible on satellite view which we’ve omitted to try to keep this a reasonable length, with the best possible images, but if you know of any that we’ve missed which are clearly visible, please link to them in the comments to help make this post as complete as possible. 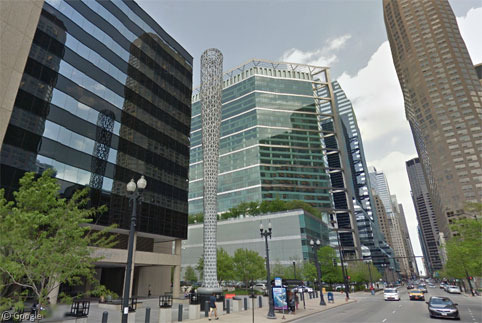 Batcolumn in Chicago is a 31m (101′) tall representation of a baseball bat, from 1977. 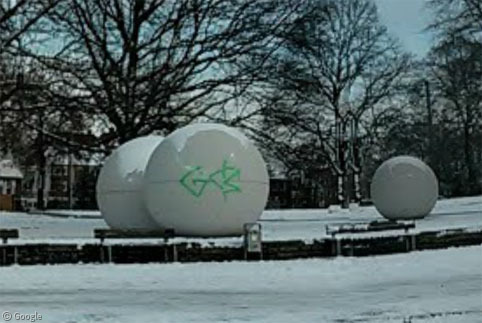 1977’s Pool Balls in Münster, Germany, can be seen (unfortunately with graffiti) in this PhotoSphere by Sascha Koalick. 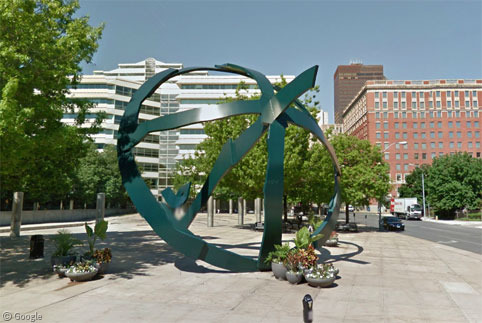 Crusoe’s Umbrella was installed in 1979 outside the Civic Center of Greater Des Moines. 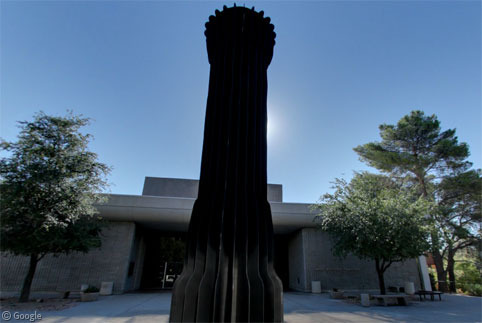 The 12m (39′) Flashlight, from 1981, stands on the campus of the University of Nevada in Las Vegas. 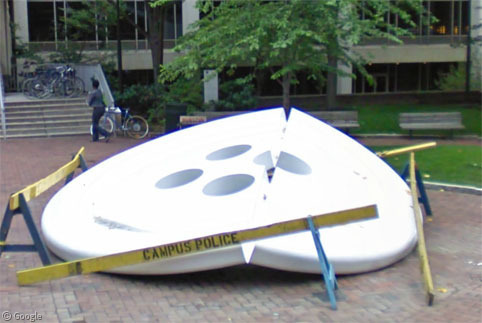 Split Button is another Philadelphia sculpture – it is found in a park on the University of Pennsylvania campus. 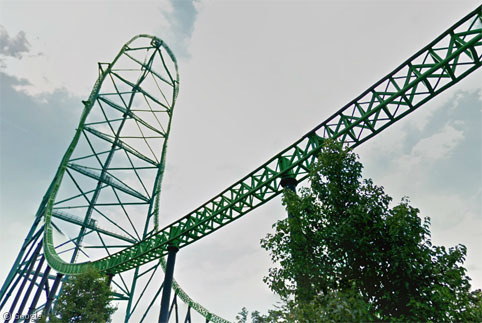 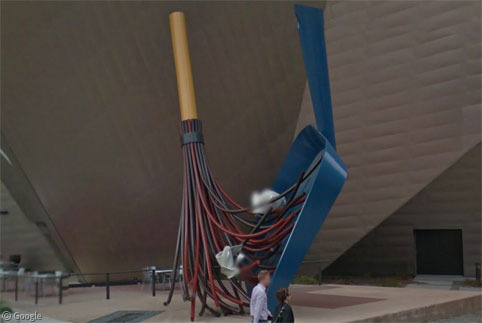 It was installed in 1981. 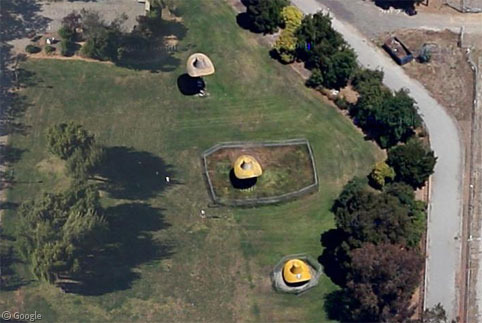 1982’s Hat in Three Stages of Landing can be seen on the 45° view of Sherwood Park in Salinas, California. 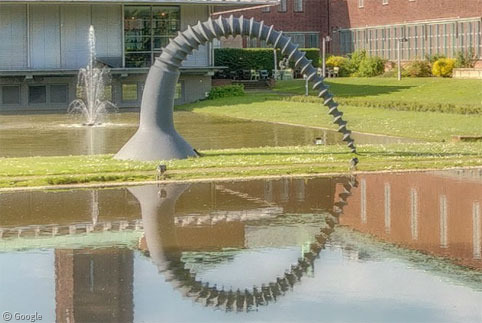 In the garden of a museum in Rotterdam, we find Screwarch from 1983, in this PhotoSphere by Alexis Jemus. 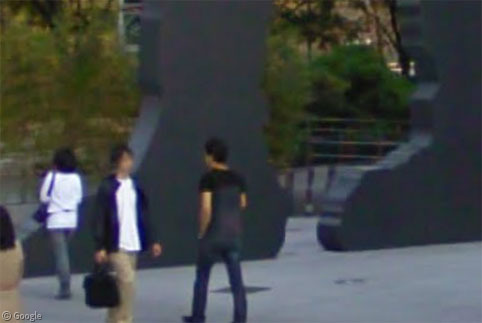 We can just about make out the form of Balancing Tools, which is on the grounds of a design company in Germany. 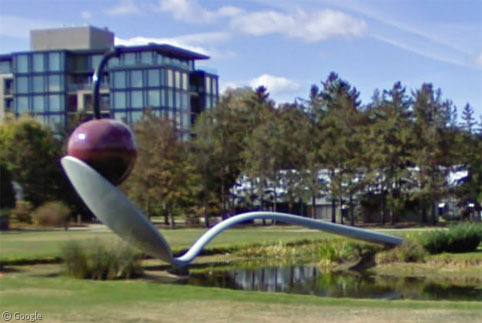 Spoonbridge and Cherry was installed in 1988 at the Minneapolis Sculpture Garden. 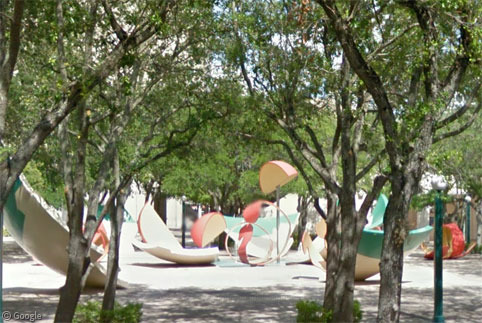 1990’s Dropped Bowl with Scattered Peels can be glimpsed through the trees of a Miami park. 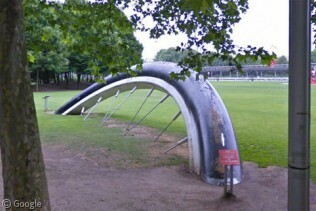 Meanwhile, at a park in Paris we can see the various elements of Bicyclette Ensevelie (Buried Bicycle), also from 1990. 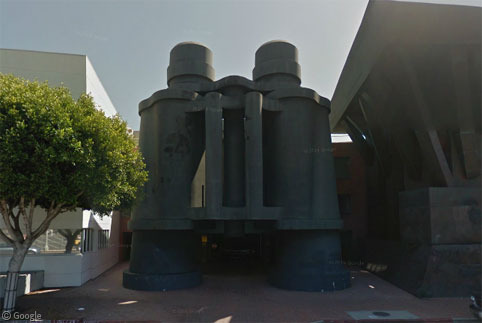 Binoculars on Main Street in Venice, California, is a central component of a building designed by Frank Gehry in 1991. 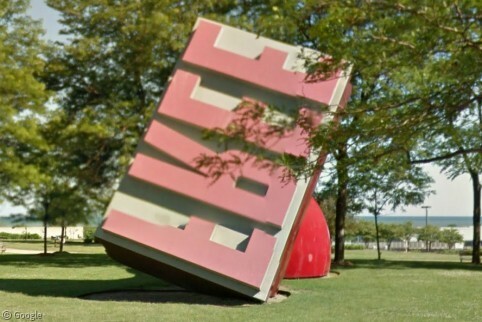 In Cleveland, the Free Stamp is a sculpture that we’ve visited before. 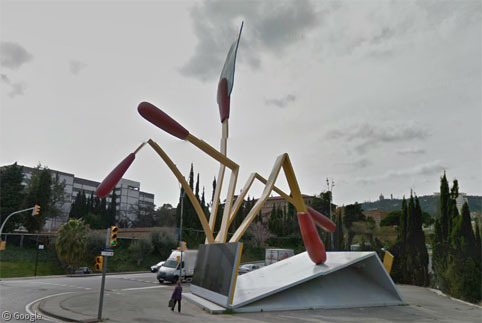 Mistos (Match Cover) is found in Barcelona, from 1992. 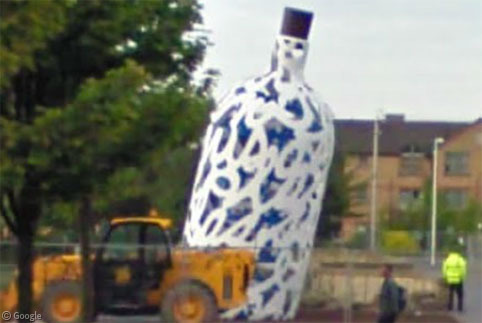 Bottle of Notes, 1993, stands in a park in Middlesborough, England. 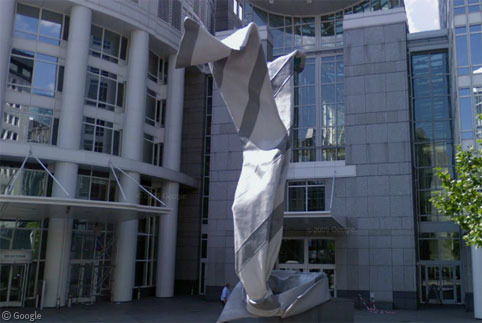 While in Frankfurt we find 1994’s Inverted Collar and Tie. 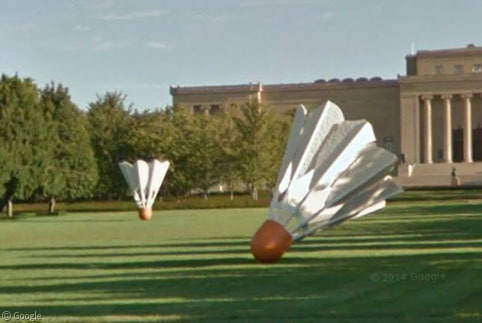 From the same year, Shuttlecocks is a series of four 5.5m (18′) tall sculptures at an art museum in Kansas City. 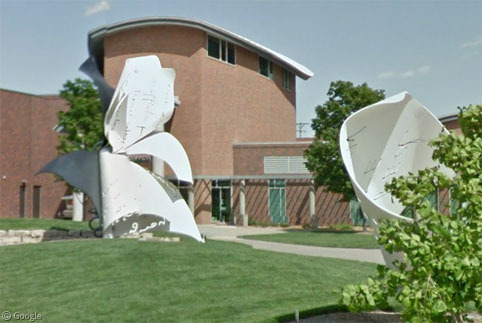 … and Torn Notebook in Lincoln, Nebraska. 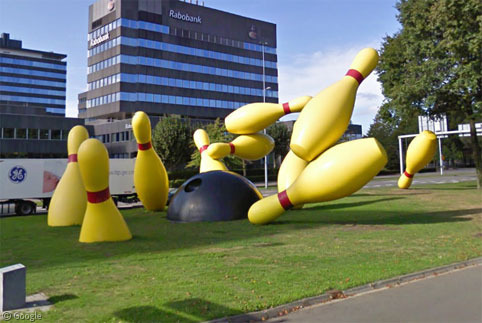 … and Flying Pins in Eindhoven. 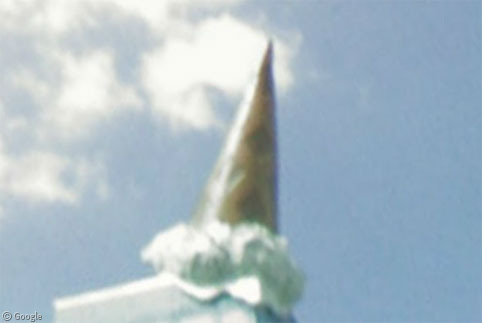 Dropped Cone, from 2001 stands atop a building in Cologne. 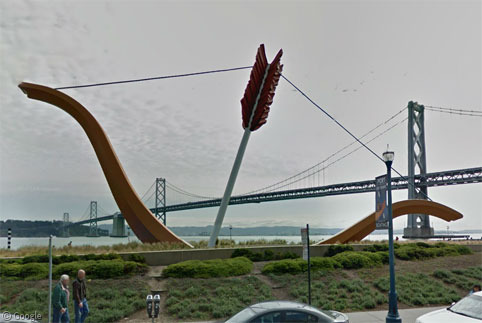 Cupid’s Span in San Francisco was created in 2002. 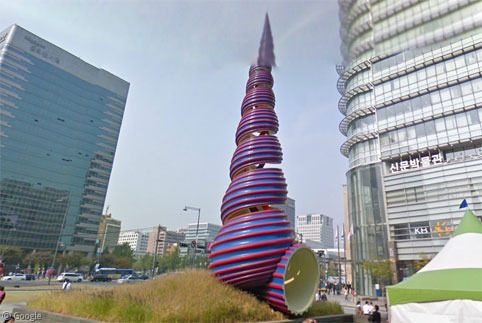 … and Spring in Seoul. 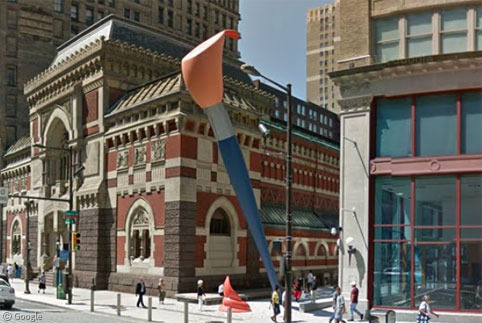 Finally, another work in Philadelphia, 2011’s illuminated Paint Torch, which stands outside the Pennsylvania Academy of Fine Arts.